Volvo is preparing to launch its C30 Electric vehicle but it has a unique twist. This car uses bio-ethanol to generate heat in the winter to keep passengers toasty warm. It is unusual in that the heater doesn’t draw power from the battery and thus doesn’t affect the driving range of the electric car (EV). 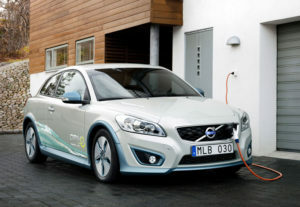 The announcement came in conjunction with Volvo’s successful tests to drive the C30 Electric in extreme cold temperatures up to -20 degrees Celsius. In the past, some electric vehicles have struggled in winter conditions with the stress of cold temperatures significantly lowering the driving range of the EV. Speaking of climates, the C30 Electric has three climate systems. One system cools or warms the battery pack as necessary, and another climate system uses water to cool the electric motor and power electronics. The final climate system supplies passengers with heating or cooling and this system runs on bio-ethanol. The car’s ethanol tank holds up to 14.5 litres of bio-ethanol. It is also possible to operate the heater and air conditioning using electricity from the batteries. In electric mode an immersion heater warms up the coolant in the climate unit. “The driver can program and control the climate unit to suit the trip. Ethanol is the default mode that is used when the battery capacity is needed for driving extend mobility to its maximum. However, on shorter distances electricity can be used to power the climate system,” concluded Stegland.